Oliver Cromwell is one of English history’s most controversial and enigmatic figures. An original rebel, his fame rests on his leading a revolt against the monarchy and his attempts to turn Britain into a republic. Cromwell inspired the beginnings of a more democratic society but his methods were often brutal and bloody. This has led commentators and historians to interpret his character and motives in radically different ways. On the 400th anniversary of his birth, the arguments over whether he is a hero or a villain have been re-ignited. Special events around the country are being staged to commemorate his anniversary. In Huntingdon, Cambridgeshire, a 17th century marketplace will be reconstructed this weekend. Earlier this year, an exhibition called Cromwell: Warts and All, at the Museum of London, exemplified the debate about him. Exhibits, including many rare books, paintings and a bizarre array of supposed relics, showed how opinions of Cromwell have always been fluid. Some might doubt the need for more opining about Oliver Cromwell. To this day, he has suffered a variety of split personalities at the hands of his interpreters. In print, paint and plaster and myth he has been seen as devil incarnate, deluded fanatic, hero and man of God. Evidence also suggests Cromwell was a man of honesty. When commissioning a portrait of himself, he told the painter: “I desire you would use all your skill to paint my picture truly like me … warts and everything.” The artist duly obliged. In 1645, Cromwell’s New Model Army famously destroyed the king’s forces at the Battle of Naseby, then went on to put down rebellions in Wales and Scotland over the next six years. Nowhere is Cromwell’s reputation more controversial than in Ireland where he was sent to put an end to almost a decade of insurrection. In September 1649, Cromwell’s 12,000-strong forces stormed Drogheda, north of Dublin. 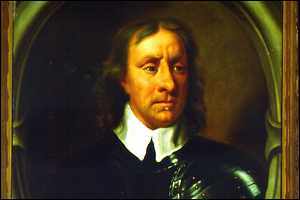 HIs troops massacred nearly everyone in the garrison and the town – which Cromwell justified as the “righteous judgment of God upon these barbarous wretches”. A month later Wexford suffered the same fate and both incidents, justified by the British as militarily necessary to subdue the population, still figure strongly in Irish republican history. Many also hold Cromwell responsible for the execution of Charles I in January 1649, although there were 59 signatories to the death warrant. This view is reinforced by books, paintings and prints depicting the king as a saintly martyr and Cromwell as a tyrant and regicide. 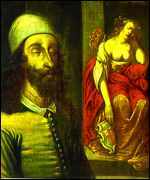 In one, a contemporary portrait of Charles I after his execution, the king sports a holy expression and a livid scar where his head has been stitched back on. Despite this opposition Cromwell established his status and authority. 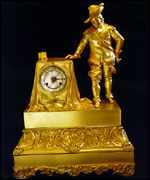 Supported by the army, he was appointed Lord Protector in 1653. It was a remarkable achievement for a man who had had little military experience before 1642. He consistently attributed his military success to God’s will. Historians point to his courage and skill, his care in training and equipping his men and to the tight discipline he imposed. 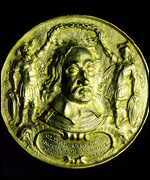 Commemorative medals were struck as his popularity grew. This admiration was revived in the 18th and 19th centuries, when Cromwell “the great leader” was portrayed on coins and tankards. When he died in 1658 of malaria, England was prosperous and the seeds of a constitutional government had been sown. But he failed to establish a written constitution or leave a lasting system of government. Cromwell was given a truly regal funeral ceremony, costing around £60,000 – at a time when the average wage was one shilling a day. But by the time of the restoration of the monarchy in 1661, Cromwell was again an object of hate. 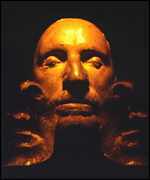 His body was exhumed, hung at Tyburn (Marble Arch) and later cast into a pit under the gallows. 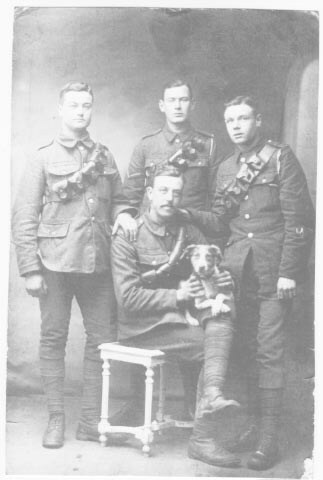 Another story says that the severed head, mounted on a pole, fell at the feet of a soldier one windy night. It is now supposedly buried at Sidney Sussex College, Cambridge. In modern times, most writers have preferred to debate whether Cromwell, good or bad, has been the product of propaganda. Their pages have helped to make up the estimated 4,000 books written about the man. Consensus of opinion remains elusive, however. And if nearly 400 years of debate have failed to settle the issue of his reputation once and for all, it seems he is destined to forever be Britain’s most controversial ruler. Very good documentary on Cromwell with differing views on Cromwell the man and leader. Below an examination of Cromwell and his Irish campaign. Do you think his behaviour in Ireland was acceptable in the context of the mid 17th century. Did you know that he is still regarded as a brutal killer within the modern Irish population 350 years later!